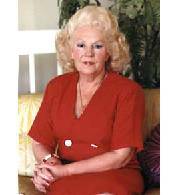 Irene Gut Opdyke (1922-2003) was a Polish heroine who saved many Polish Jews from the German gas chambers and SS troops. In a feat of courage and at risk of her own life, she rescued Jews from certain death. Gut was one of five daughters born into a Catholic family in a small village in Easter Poland. When the family moved to Radom, she enrolled as a nursing student. In 1939, the German Army invaded Poland and within a month the country was defeated and partitioned among Russian, Austria and Germany. Irene volunteered to join an Army unit and went into hiding in the Ukrainian forest where she was taken prisoner by the Russian soldiers who raped her and left her in the snow to die. She escaped, but was later arrested in a round up of Polish citizens. In April 1942, Gut witnessed an event, which would transform her life. She saw a Nazi officer toss an infant into the air and shoot him like a bird. No longer able to stand by and watch the growing barbarism by the Germans, she became a participant in the fight to save the Jews from being slaughtered. The terror grew. At the public market, the Gestapo forced her and others to watch a public hanging of a Jewish couple and the Polish rescuer who had tried to help. While working as a forced laborer in a munitions factory, Irene caught the eye of a 70-year-old German Major, Edward Rugemer. By that time the German Amy in the East, desperate for trained officers, had raised the age limit. Major Rugemer found her an easier job in the kitchen of a hotel for German officers. The kitchens were close to the walls of the local ghetto and each night she would gather leftover food and smuggle it through the barbed wire fences. Unbelievably, Gut went undetected for months. She was successful in her endeavors. Soon she began to smuggle Jews out of the ghetto into the forests. Throughout Poland the vast forests served as a shelter to Jews from the Germans. She returned again and again. Major Rugemer soon promoted her to be his housekeeper in a villa, which had been taken over by the Germans. It had a large basement where Irene hid twelve Jews who were due for deportation to the gas chambers. They helped her with her duties and came out of the cellar each day. Major Rugemer normally stayed for the entire day but one day unexpectedly returned early and was astonished to see Jews in his house. Immediately he went to call the SS, but before he could the call, Irene pleaded with him to save the lives of the Jews. Rugemer made a deal with her; their lives for her body. There was no way out for Gut. She became his mistress in order to save the Jews. They continued to live in the basement and had no knowledge of the agreement. Gut, who had been brought up as a catholic, went to a local priest to make her confession, but he would not give her absolution She remained a Christian, but in later years, she became a Protestant. As the Russian Army swept westward, towards Poland, Edward Rugemer left with the Germans before the Russians could overtake them. In early 1944, Gut and the Jews had fled into the forest where they stayed until the Russians gained control of Poland. They were then put in a ”Displaced Persons” camp. Every one of her protégées had been saved due to her bravery. Later, most of them found their way to the new State of Israel. After the war, in the middle of the confusion and brutality, Gut was smuggled away, with help from the Jews she had befriended, from the Russian occupied Poland into West Germany. Three years later, she was able to obtain the papers, which allowed her to go to the United States. At the camp for ”Displaced Persons ” she was interviewed by William Opdyke, an American United Nations worker, and told him her story. By chance, Irene ran into him again in New York City and they were married shortly after. They raised a family and led a quiet life. Twenty-five years later, as if by fate, Irene was asked to fill in as a speaker at her husband’s Rotary Club. Up to then she had locked the past out her mind. Irene decided for the first time to speak about her past as a participant and eyewitness. 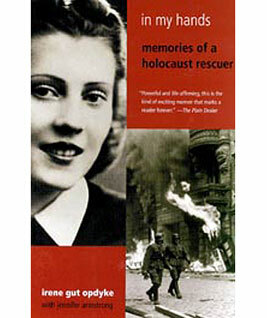 In 1999, she wrote a book about her experience: ”In my Hands: Memories of a Holocaust Rescuer.” The book sold more than a million copies. For many years, she continued talking about her experiences traveling back and forth across the country. In later years, the Israel Holocaust Commission named her one of the ”Righteous among the Nations”, a title given to those who risked their lives saving Jews from the Holocaust. She was presented with the Israel Medal of Heroes, the country’s highest tribute at a ceremony at Jerusalem’s Yad Vashem Holocaust Memorial. The Vatican also bestowed an honor on Gut.